At some point in time, a photographer who is serious about taking their photography to the next level needs advice and guidance from someone more experienced. This can be accomplished in a number of ways, however one method for gaining feedback on one’s work that is a long-established, and highly respected, practice in the art world is a portfolio review. While some photographers use a portfolio review to open doors to exhibit offerings or book deals, I simply was looking for some guidance and thoughtful comments from an experienced expert. I wanted to watch for reactions as a total stranger perused my images. Most typically a photographer will move from table to table, spending a day traveling from reviewer to reviewer. I felt like I wasn’t quite ready for that extensive of a review experience. When SlowExposures offered ‘Mini Portfolio Reviews’ I decided this might be just the perfect way to get a sample of the review process. Being frank, I’ve heard some real horror stories about certain portfolio reviews; reviewers whose rather candid comments would bite and sting. All I could do was hope and pray that I either didn’t run into that kind of experience or that if I did I could be mentally and emotionally tough enough handle it. We artists do get attached to our work and often don’t see it in the same light as others. A couple of boxes of fine art paper and hours of printing – and re-printing – images later, I boxed up my sampling of work and drove five hours to Concord GA, arriving just in time for my appointment. When my name was called, I took a deep breath and walked over to Dennis Kiel’s table. With a handshake and a few cordial pleasantries, the process began. It was obvious that I was a novice regarding the review process, but the photography gods were with me by allowing me to have Dennis for this first experience. He gently and patiently talked through my work; making many careful and thoughtful comments and suggestions. Since I had the last time slot of the day, Dennis was gracious enough to extend our conversation beyond the allotted time. Without using the words ‘like’ or ‘dislike’ regarding my images, we discussed concepts of line, shape, or color. We talked about mood in the images and how keeping the mood similar from piece to piece would lead to more continuity. He gave me suggestions of how better to build a cohesive body of work. I quickly sensed what he thought worked…and what didn’t! Did I get my ‘money’s worth’ from the experience? Absolutely! Will I subject my portfolio to a full review experience? Absolutely…especially after I take into consideration the suggestions made by Dennis during this first mini review. Before I sign off on today’s blog post, I have to extend kudos to the volunteers behind the SlowExposure ‘experience.’ I say ‘experience’ because the week-end was far more than simply a portfolio review and a juried exhibit! Packed into two short days, Sandy, Renee, and I visited three awesome photography exhibits, enjoyed a wonderful dinner complete with live music, an after-hours party, and a delicious brunch. 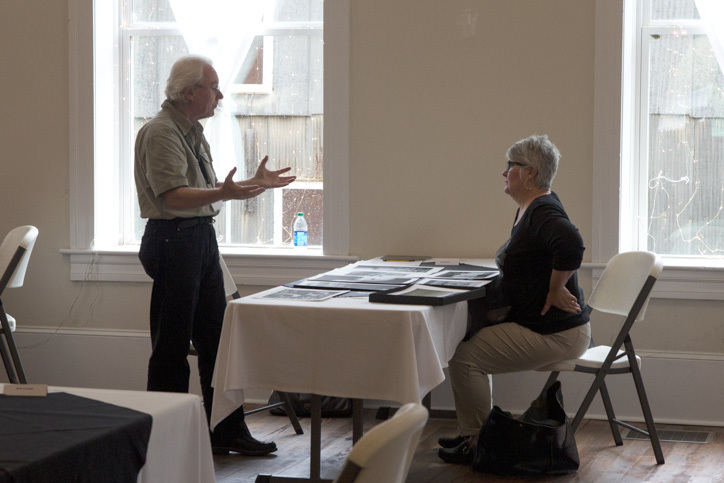 We listened and learned from two different juror talks in addition to undergoing the portfolio reviews. We met jurors and photographers, making new connections and friendships. We came home tired, but inspired! Visit our Scrapbook for more photos from the week-end! This entry was posted in Sue Henry and tagged Atlanta GA, Body of Work, Fine Art Photography, Photography, portfolio review, SlowExposures, Sue Henry Photography on September 24, 2013 by f4studionashville.